What is it that draws us back to this bare brown village time and again? 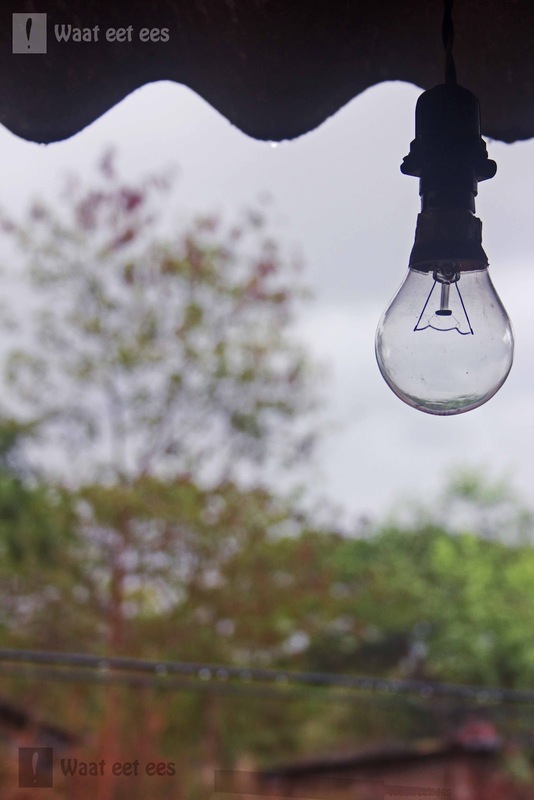 We'd imagine it's where our ideas and designs come to life. Where our artist resides, in his mud baked hut with Warli growing across the walls. He paints a fresh patch in the time between our frequent visits to his rustic home. A few chaotic rickshaw, bus, train and dumdum rides and we reach our destination. Though only once after the pace slows down and the noise disappears, are we assured that we’ve indeed reached the village. Over glasses of cold water, we explain our designs to him, working, helping and learning to merge our ideas together. Engrossed in the task at hand, time flies by. In breaks, we watch the afternoon shadows emerge and drown into the backyard earth. Sometimes there are glistening red chillies left out to dry with pieces of marinated fish in a steel plate. During lunch, an over-eager brood of chickens runs upto us and hangs around for company. There's also a cat, who conveniently chooses to snooze only under our drying umbrellas. We soak up as much of all this lazy calm as we can. And try to preserve a little till we get back to the city. Evening brings what we eagerly look forward to, other than our work ofcourse, on every trip we make. 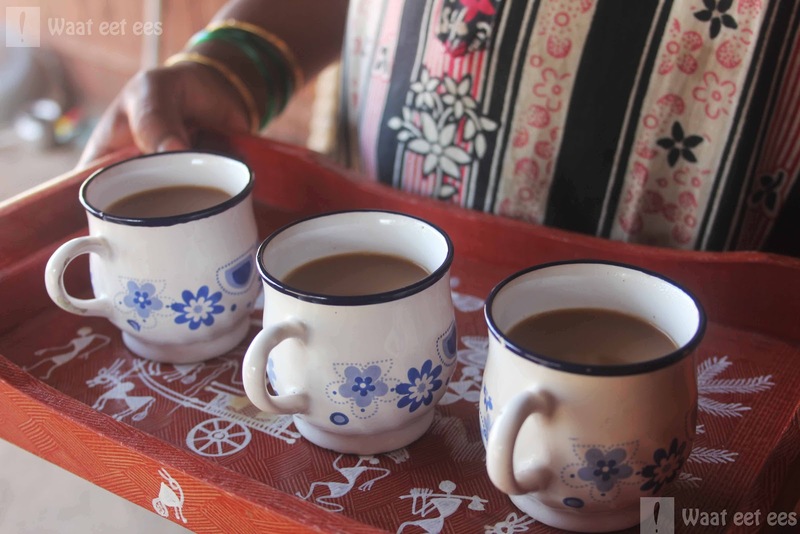 Sitting pretty in white cups on a Warli tray, we can smell its lemon grassy cardamomyness right from a few feet away. It's a typical black tea that the women in the house prepare during afternoon evenings. It's super sweet and delightfully refreshing. We know we’re done only when we’ve emptied the last’est’ drop cup-upturned into our mouths. In between, rounds of interesting conversations happen. 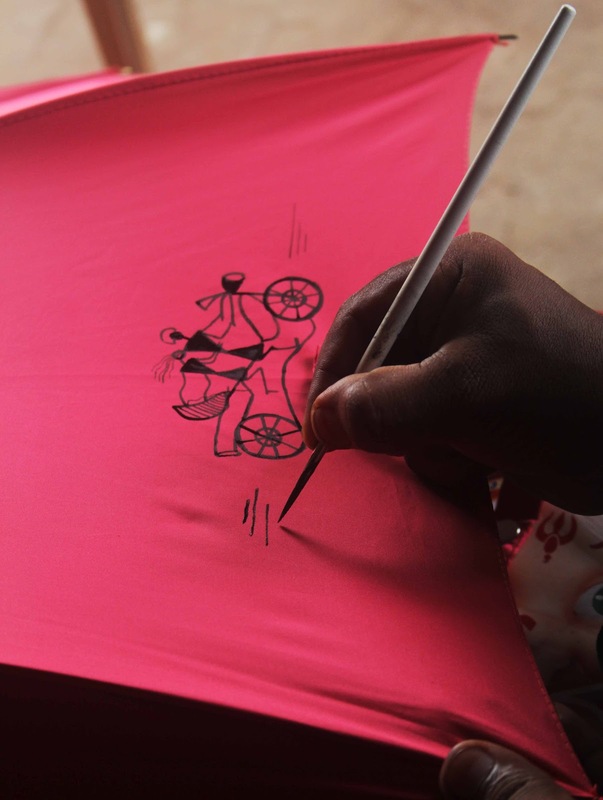 He tells us how Warli art has been around forever. Since the time man painted on cave insides. We nod and recollect reading about cave paintings in Bhimbetka, Madhya Pradesh and how similar Warli is to those. He also points out how Warli as a language is a mix between Marathi and Gujarati. And how subtly different in pronunciations it is from Marathi. We learn that manjar (cat) in Marathi is majar in Warli. From his personal history, we learn he inherited the art from his grandmother, like a gift, passed on from one generation to another. But getting to being satisfied and content is quite the struggle we’ve learnt. Over the past few months we’ve tried and tested every possible paint before we found the one works umbrellas. After being miserably heartbroken over missing heads, hands, feet and other parts of our designs, we researched about and tested our products to finally figure out a customized paint that worked the magic. Speaking of magic, a memory that needs to be shared – As we were trudging along on our way back home one evening, exhausted from two back to back days full of work, dragging along our bags and baggage, we were witness to a typical rural wonder. Up ahead on our almost pitch black path, we spotted a huge tree, aglow with a million fireflies. Just for that little bit, our bags seemed lighter. WoW! DC, damn! please get an adsense account, u r sure to rake in a sizeable moolah! via ur writing. Absolutely loved ur writing, it's like reading a Anita Desai. Bravo!! @Kenny Thanks :) Can totally imagine the cat singing and swaying to 'Under my Umbrella'.. She's whacko! Warli Art ~ Waat eet ees?